Now that cats are inside our homes a lot more rather than roaming outside where they’re subjected to many dangerous situations, It’s very important that we provide “stimulation” so they can experience similar things they might get to experience as an outdoor cat, but without all the dangers. Some of the items below, in part, will help provide Physical and mental exercise which is essential to a cats happiness, the other part is being proactive with your cat, I recommend teaching your cat how to walk on leash or teach them other tricks. Mental exercise is more effective at tiring them out than physical exercise. Plus can help cut down, or totally eradicate some behavioural issues like, boredom, scratching furniture, biting/scratching you, destructive behaviour, or maybe your cat is a little overweight and can benefit from being more active? A trained cat is a more confident cat, and this will enhance the bond that you share. DaBird – Best cat toys EVER! (choose which one is best for you, don’t forget your refills). Make sure you hide the toys away when not in use. I need to hide mine in dresser drawers, I need to make sure the draws are completely shut or Boomer will pull them open, and proceed to chew them on the floor. PET CARRIERS - Don't wait till the "day of" travel or pet visit to shove your cat inside a pet carrier. it can take weeks of practice that is very easy to do, to acclimate your cat to their carrier. Have you seen all the videos lately with the cat laying in one of these while riding in a car? These are relatively new item, and can be stuck on a window in your home OR if your cat likes to ride in the car, this might be wonderful for them. What items does your cat really enjoyed? I think this is a great article because these products are gaining in popularity and in creativeness. 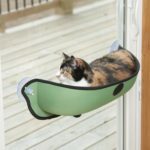 I have a few cat trees for my cat Bruno and am considering getting some wall-mounted cat shelves or steps as well as the cat perch attached to the window as mentioned in this article. My cat can spend hours looking out the window. Thanks Catmantoo, Didga and Boomer!